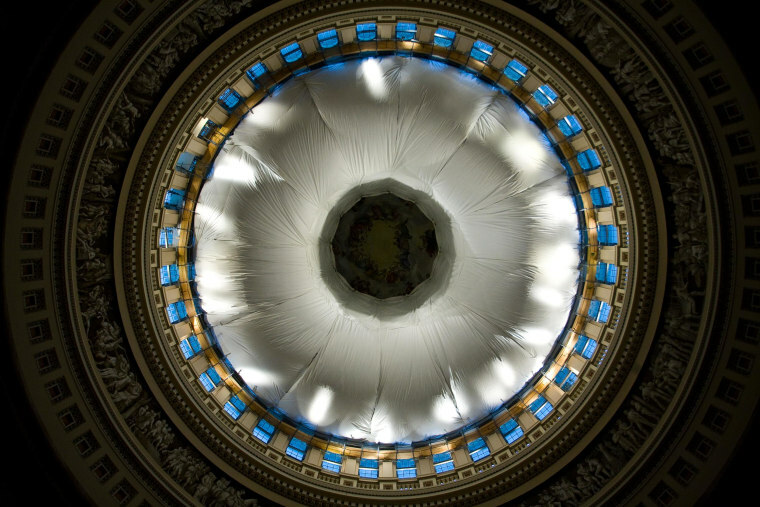 The Architect of the Capitol unveiled a protective netting in the rotunda of the U.S. Capitol in Washington on Wednesday. The netting will be in place for about a year and a half to protect members of Congress, staff, and visitors during the project to restore the building's iconic dome. The protective measure consists of five layers including 14,700 square feet of material (approximately the size of two tennis courts). The netting, which weighs a total 6,100 pounds, is designed to capture and hold a 500 pound object falling from the ceiling. The scaffolding on the exterior of the dome will be in place at the end of May, Architect for the Capitol Stephen Ayers says. The deadline for completing all the phases of the project is inauguration 2017. Nearly 2.5 million visitors come to the Capitol each year, and the rotunda will reopen to the public tomorrow.